All too often I listen to people complain about their disdain for eating vegetables. No, it’s not just coming from children. In fact, plenty of adults also struggle with eating a plate full of veggies at every meal, making fat loss a struggle for many folks. When you’ve hated broccoli, spinach and carrots for 20 plus years, it’s just not that appealing. 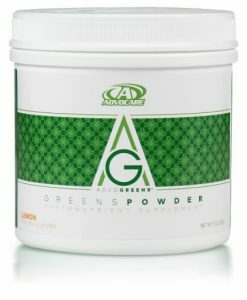 Advo Greens Powder is a Phytonutrient (Plant) supplement that helps support your healthy lifestyle by incorporating more fiber and plant derived phytonutrients into your diet. This amazing lemon-flavored vegetable powder provides antioxidants, vitamins A, C and E to help overall wellness and digestive health. Best of all, it’s quick and easy, eliminating every excuse to eat your greens! If you have any nutritional questions or needs you may need help with please connect with us!